This is a mixed quarter or a combined hind and front quarter as packaged by the butcher with all of the cuts fairly divided. This amounts to less than $6/lb hanging weight. For customers between Ottawa and Lanark county who don't have large freezers and who would like to order a quarter, we can deliver in five instalments. Raised from the first day of life in moveable, wheeled coops, our chickens get fresh grass daily and sometimes more often as they age. They receive certified organic grain to supplement their intake of grass and bugs. As a result, these chickens grow more slowly and more flavourful than they would in a barn or coop setting. Another side-benefit is that their manure fertilizes and nourishes the soil in quantities that the land can handle. 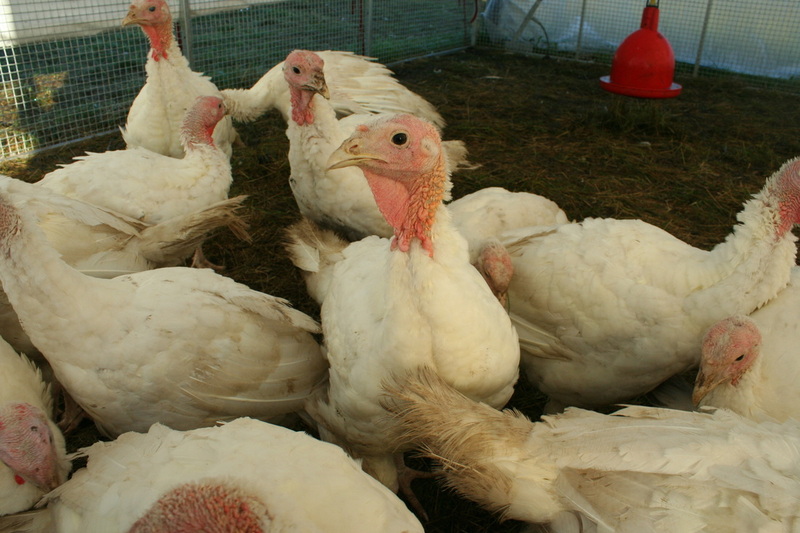 We raise our turkeys the same way as our chickens -- on grass, with certified organic grain in wheeled coops that are moved regularly. Eggs | $7/dozen (when available). Our laying hens live in a spacious coop with ample roosting and nesting places. After laying their eggs in the morning, and when predators are at bay, they roam the farm until dusk, upon which time they wander back home. They are fed only certified organic grain, ground up oyster shells (for extra calcium) as well as occasional family table scraps and they snack on bugs and grass outside. After snow covers the ground the hens tend to stay indoors although they are given opportunities to go outside when weather permits. * PLEASE NOTE: ALL PRODUCTS SUBJECT TO AVAILABILITY. LATEST PRICES ARE AS OF APRIL 4, 2019. PRICES MAY BE SUBJECT TO CHANGE. WE DO OUR BEST TO UPDATE THE WEBSITE AS OFTEN AS POSSIBLE.